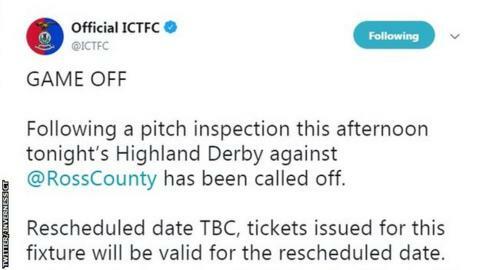 Inverness Caledonian Thistle's Scottish Championship match against leaders Ross County on Friday has been called off because of a waterlogged pitch. Overnight rain in Inverness had put the evening fixture in doubt and a pitch inspection took place around 12:30 GMT. The Highland derby had been scheduled to be broadcast live on BBC Scotland but will now be rearranged. County are 11 points clear at the top while Inverness are fifth, a point off the promotion play-off spots. There are four second-tier fixtures scheduled for Saturday at 15:00 GMT. Match ends, Inverness CT 1, Ross County 2. Second Half ends, Inverness CT 1, Ross County 2. Sean Kelly (Ross County) is shown the yellow card for a bad foul. Liam Polworth (Inverness CT) wins a free kick on the right wing. Liam Polworth (Inverness CT) wins a free kick in the defensive half. Foul by Josh Mullin (Ross County). Foul by Liam Polworth (Inverness CT). Jamie Lindsay (Ross County) wins a free kick in the defensive half. Foul by Jordan White (Inverness CT). Marcus Fraser (Ross County) wins a free kick in the defensive half. Substitution, Inverness CT. Anthony McDonald replaces Carl Tremarco. Attempt missed. Josh Mullin (Ross County) right footed shot from outside the box misses to the left. Attempt missed. Brian Graham (Ross County) right footed shot from outside the box misses to the left. Attempt saved. Brian Graham (Ross County) right footed shot from the centre of the box is saved in the top centre of the goal. Joe Chalmers (Inverness CT) is shown the yellow card for a bad foul. Josh Mullin (Ross County) wins a free kick on the right wing. Foul by Joe Chalmers (Inverness CT). Shaun Rooney (Inverness CT) is shown the yellow card. Liam Polworth (Inverness CT) is shown the yellow card. Lewis Spence (Ross County) wins a free kick in the attacking half. Jamie McCart (Inverness CT) is shown the yellow card for a bad foul. Brian Graham (Ross County) wins a free kick in the defensive half. Foul by Jamie McCart (Inverness CT). Jamie Lindsay (Ross County) wins a free kick in the attacking half. Substitution, Inverness CT. Shaun Rooney replaces Brad McKay. Attempt missed. Josh Mullin (Ross County) left footed shot from outside the box misses to the left. Substitution, Inverness CT. Nathan Austin replaces Tom Walsh. Substitution, Ross County. Brian Graham replaces Daniel Armstrong. Jordan White (Inverness CT) wins a free kick in the attacking half. Foul by Kenny van der Weg (Ross County). Attempt saved. Tom Walsh (Inverness CT) left footed shot from the right side of the box is saved in the top centre of the goal. Attempt missed. Jordan White (Inverness CT) right footed shot from the centre of the box is close, but misses to the right. Foul by Daniel Armstrong (Ross County). Liam Polworth (Inverness CT) wins a free kick in the attacking half.